This is quite one of the most extraordinary documentary series ever produced and can proudly sit next to The Civil War and The World at War as an example of just how good television could be. And yet, Schama presents his view so well - and so entertainingly - that time absolutely flies by and the haunting end credits and soundtrack are on you faster than the Black Death. When the show was on TV the wait between episodes was interminable. Now, with it on DVD, I was able to sit down in a couple of sittings and swell the old brain with masses of images, facts, details and opinion on the people of my heritage. And on the matter of opinion it is fair to say that Schama - a professor of history at Columbia University - has his own view of how his country unfolded and he is not afraid to state it. There was one occasion when I got really annoyed at his insistence that the first part of British empire-building was 'evil' and I got quite hot under the collar. Having looked at the extras I now see this was all part of his plan to stir up the embers of opinion and show people that history lives. And Schama also doesn't hold back on the bloody and violent history of the British Isles and there some pretty damn horrible descriptions of how famous people died. Edward II had a red-hot poker plunged into him, while Thomas Beckett had the top of his head removed with a sword and his brains scooped out and smeared on the floor of Canterbury Cathedral. The series just has so many highlights that they are almost impossible to list. I will say that, in general, I found the earlier history more interesting than the later stages, although that is like saying the last few chapters only get an A rather than an A+. Perhaps the most fascinating episode featured the Black Death, which wiped out half of Britain's population and set in train massive social changes that could see a family rise from peasant farmers to lords within three generations. The video transfer is terrific and the sound is clear as a bell. 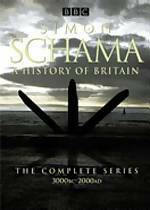 Simon Schama's A History of Britain is a must-have for all those interested in history and school teachers will find it an invaluable assistant in bringing subjects to life. From the Stone Age to the arrival of the Romans, Saxons, Vikings and Christian missionaries. The Norman Conquest of 1066, the battle of Hastings, the end of Anglo-Saxon rule. Examination of the Plantagenets, who included Henry II, Richard the Lionheart, Eleanor of Aquitaine. England's rise to dominance in the isles is traced through its lengthy and bloody wars against the Welsh, Scots and Irish. Edward I 'the Longshanks' took on all and vanquished all but Robert the Bruce. For six years the Black Death raged across Britain and when it had passed it left a much changed place. The beginning of Protestantism and its forceful usurption as the religion of state. Queen Elizabeth I versus Mary Queen of Scots and the birth of Britain. The English Civil War and the execution of Charles I. The age of the Puritans and Oliver Cromwell. Emerging from the loathing the English and Scots had for each other was a future based together on profit and interest. Exploration and exploitation as Britain makes its mark on the world. Britain comes close to its own revolution and the beginnings of the romantics era. Britain is transformed from an agricultural to an industrial society and its effects are not all positive. Britain's 'second' attempt at empire has it as the world's greatest power, although at what cost to its inhabitants. Looking to the future through the past.